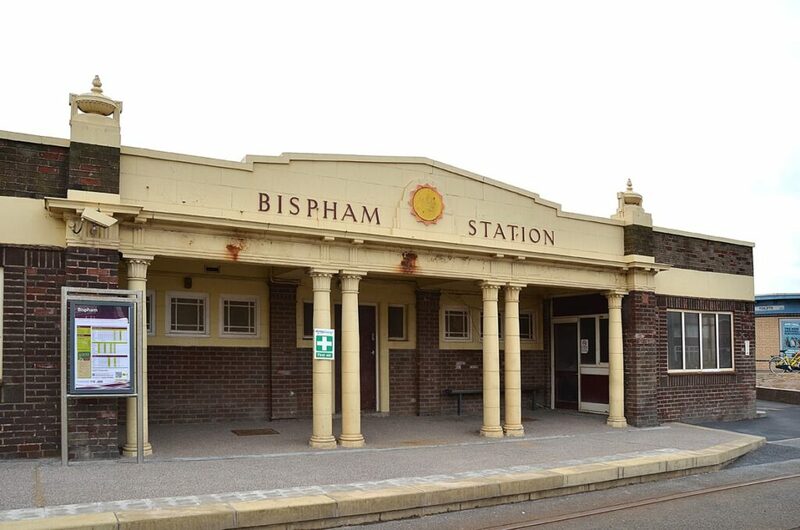 Bispham is at Blackpool North Shore. It’s marked by a main T-junction where the promenade meets Red Bank Road, and there’s a big tram stop building against the seafront. 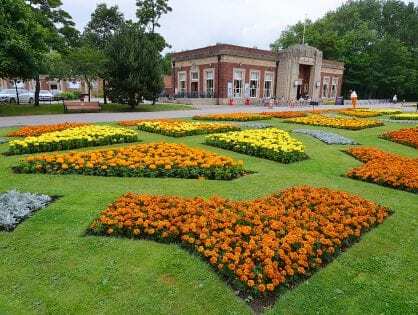 It’s also where you’ll find the small shopping centre of Bispham and a little further inland, Bispham Village. 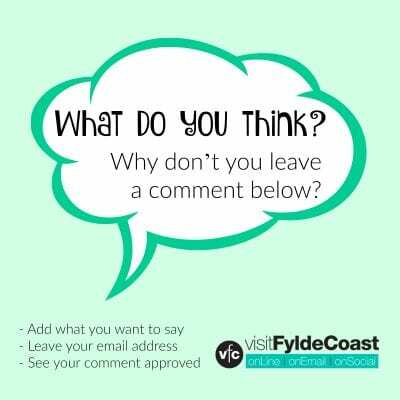 Watch this clip below – it’s a drive along the promenade from Gynn roundabout which is a little further south, arriving at Bispham and the junction with Red Bank Road. 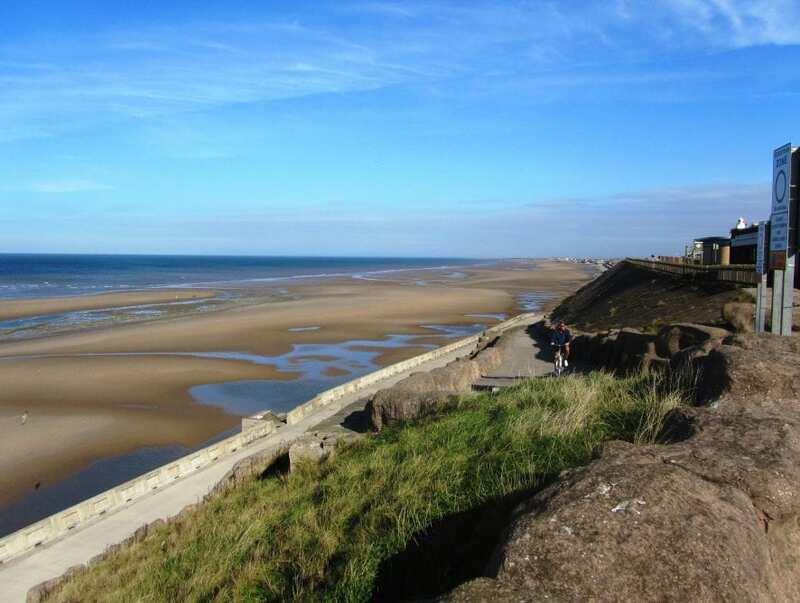 It’s from this area of coastline near to Bispham tram stop that you get spectacular views of the sea.  Look along the coast to your right to see Cleveleys. On a clear day you can see Heysham, Barrow and the Lake District beyond Cleveleys. Looking straight ahead to the horizon you can see the wind farms. 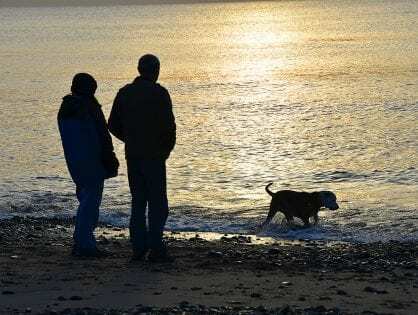 In the evening when the fabulous sunsets light up the sky you’ll sometimes see the Isle of Man with the help of a mirage! The whole of the lower promenade from Gynn roundabout to Anchorsholme near Cleveleys is a typical concrete sea defence. It’s a sheer, solid wall with steps down to the beach at regular intervals. At high tide and in bad weather, the steps are chained off with warning notices, because here the force of the sea is at its mightiest and most dangerous. 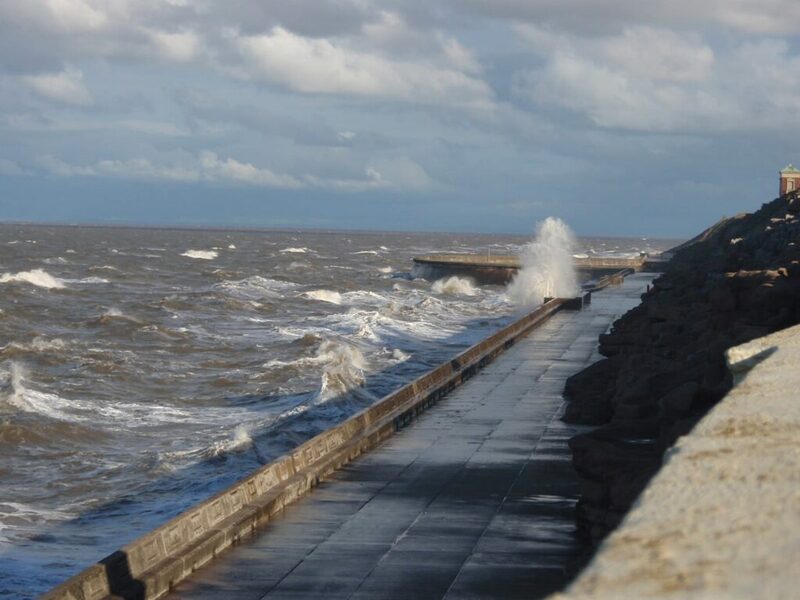 If you do decide to watch the waves, do it from the safety of the footpath on the middle or upper seafront walkway. Do not go to the lower promenade in bad weather. Many people have lost their lives over the years by being pulled into the sea at Blackpool. There are some spectacular views of rough weather to be had from here. Nothing looks more impressive than the water bashing high in the air creating twinkling spray, particularly on a sunny day. 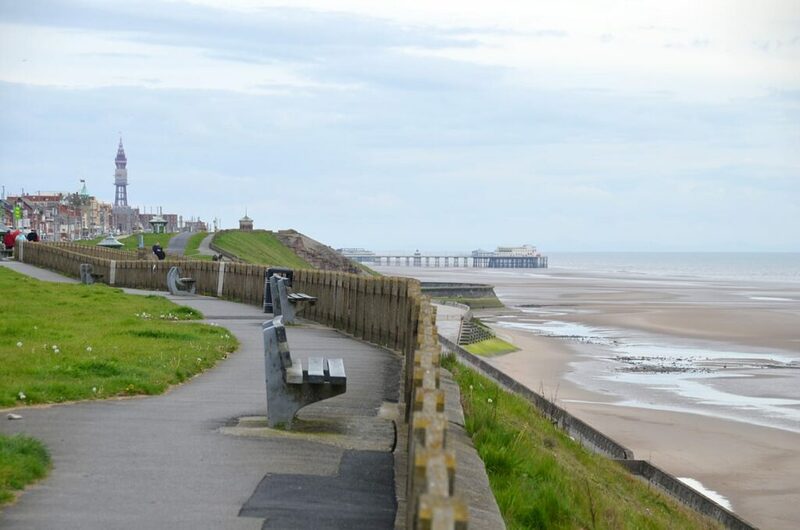 Bispham, Blackpool North Shore seafront is a sheer vertical drop from the top footpath to the lower promenade. Some of it is grassed and some is retained with concrete. There are zig-zag footpaths for you to make your way up and down the hill – the zig-zags intended to make the climb a little easier! Look more closely and you’ll see that despite the hostile conditions, the grassy bankings are actually home to some native wildflowers and plants. 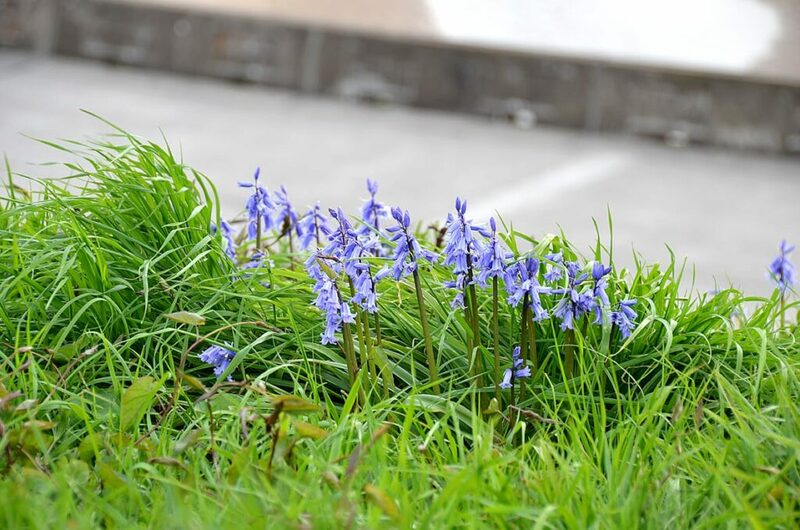 Along with other species you’ll spot sea campion, sea thrift and even bluebells growing wild there. 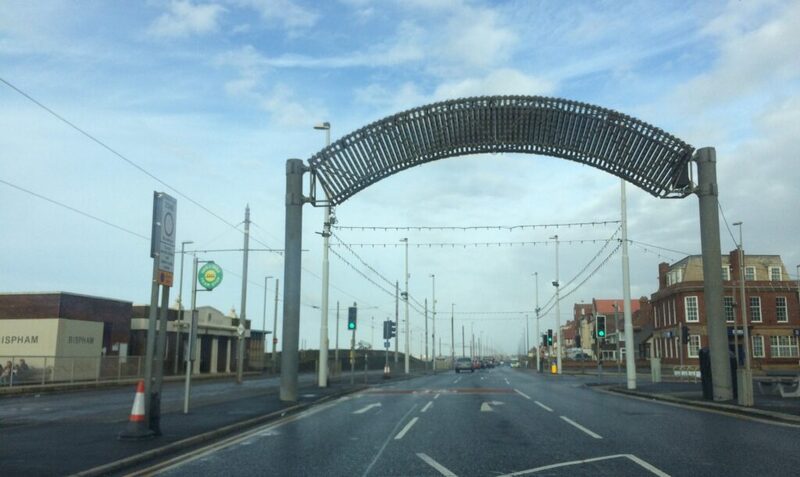 There are a number of footpaths to choose from along the Bispham area of Blackpool seafront. 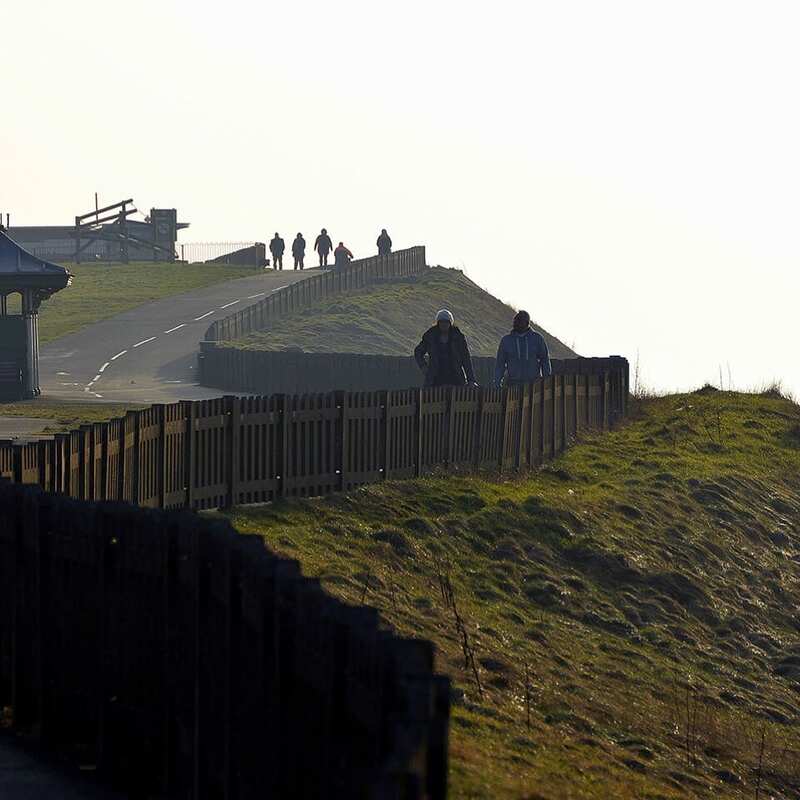 Each one of the different levels of footpath from the bottom to top contributes towards the overall sea defences. The last line of defence is the promenade walkway and footpath. This is at the top of the cliff in the space between the tram lines and the sheer drop! Separated from the traffic by an area of grass, it’s a safe place where children and dogs can enjoy some freedom. The shared tarmac path is marked out with a separate cycle way and footpath. There are shelters, benches and some bins along the way, including a number of Grade II Listed shelters. 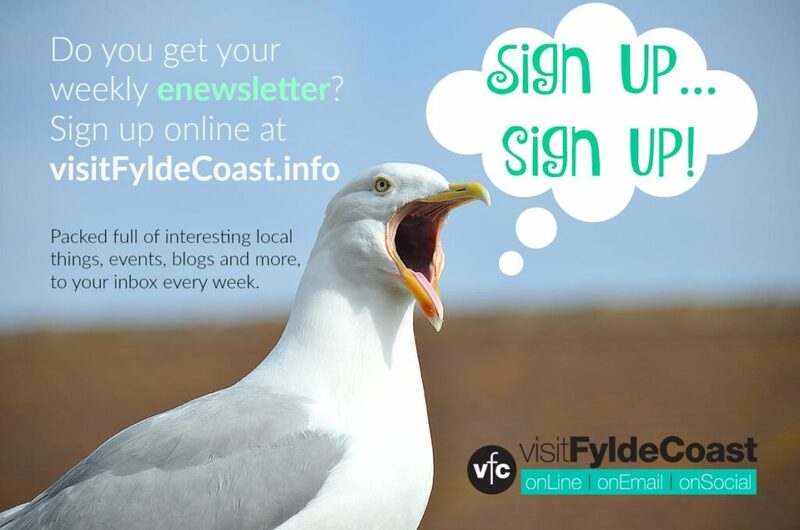 This seafront footpath runs all the way along the coast from Lytham to Fleetwood. 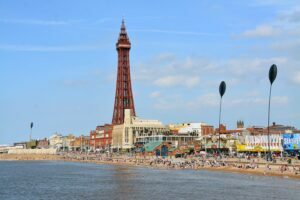 Continue your your virtual journey south, to Blackpool North Pier.